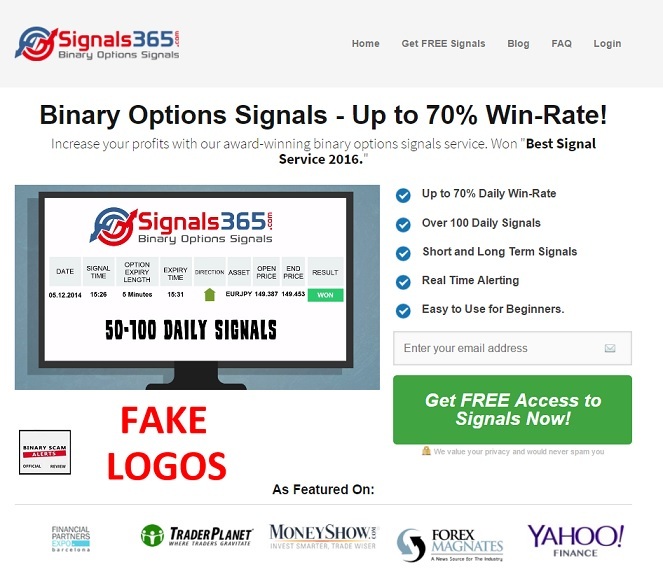 Signals 365 Review, Scam 365 Signals Exposed With Proof! 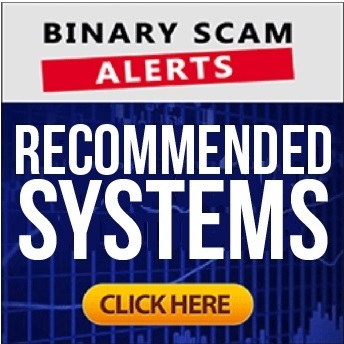 Binary Scam Alerts » Scam Reviews » Signals 365 Review, Scam 365 Signals Exposed With Proof! The Signals 365 software presented by “Adam” is a SCAM and we had no choice but to BLACKLIST this fake app in our fair and objective review and investigation. There has been much talk about this signals software, and since it has been around for a long time we understood that many traders and opportunity seekers have been mislead and deceived by this nasty scheme. Truth be said, when we started out researching this system we were actually surprised by how simple it was to get started. However, as time progressed we noticed a significant regression in the accuracy levels and after a period of 5 hours we were left with $15 in our balance and a hefty dose of remorse and frustration. When we asked to speak with the owners of the app we were politely told to “shut up” and move on, and that is when we understood we got scammed by con artists. We felt really angry this time, because this system seemed to be genuine and legit as originally advertised. It changed nothing, and at the end we ended up getting our money stolen by crooked offshore brokers who just wanted to sell us trading strategies so we could deposit again. Only this time they asked us to invest $10,000 and that’s when we just stopped everything and started on thinking about ways to get our money and original investment back. Fortunately it was only $250, but for some people this is a lot of money and could be used to pay rent or buy food. So if you are one of those people who had their wallet fleeced and want to tell us your story, please leave a message below and tell us why you believe Signals 365 is a confirmed financial scam and help us expose these criminals. Below you will see a screenshot taken directly from the Signals 365 main sales page. Under the title of “What Other People are Saying About Us” you will see a picture of someone named “Adam Simons” who is rambling about how good and profitable the signals service is. 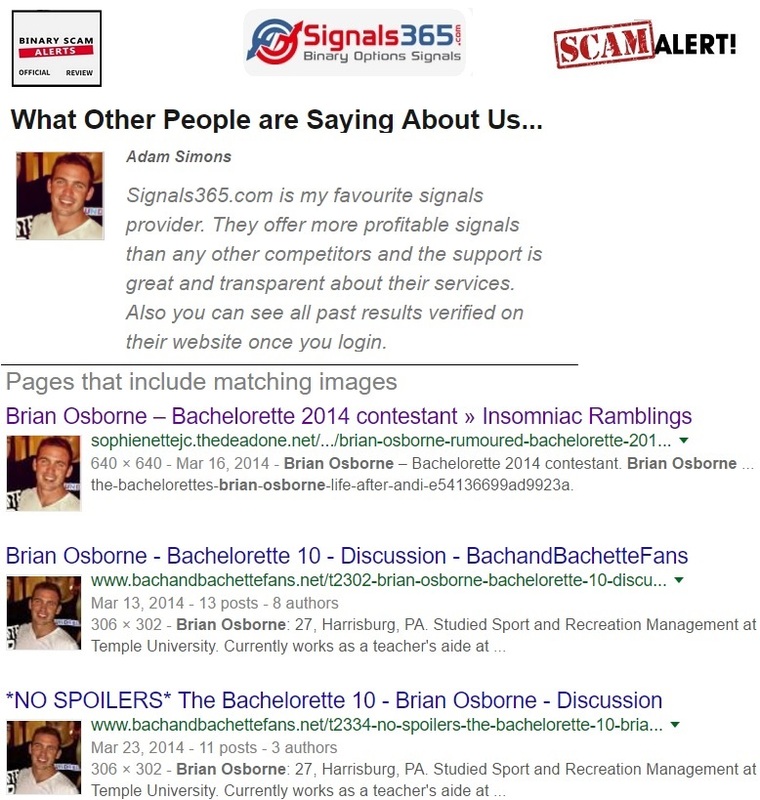 Simons is actually Brian Osborne who was a contestant in the 2014 “Bachelorette” show. We can guarantee that Osborne did not use Signals 365, and we are absolutely 100% sure he didn’t give these crooks permission to use his picture to promote their filthy app. We have a zero tolerance level for fake testimonials, and this is a clear-cut and proven case. Moving forward, above you will see the “proof of RECENT results 65-70% ITM”. First of all this information is anything BUT recent, and in fact it’s totally outdated. The latest results are taken from 2016, which means at best the results were updated 7 months ago and that excludes the results from being “recent”. Additionally, a 65-70% ITM ratio is too low and carries too much risk especially if you accept a bonus or any form of incentive. Anything less than 80-85% leaves you exposed with an account balance which is too significantly effected by fluctuating price movements and changing contract rates. The sales video starts when an animated movie shows “Adam” as a confused day-trader who has tried a variety of strategies and services but has not been able to profit. Then he finds Signals 365 which is presented to us as “a professional” binary options signals service that produces 50-100 signals a day. The sales pitch continues to say the signals expire at “up to 70%” in the money. From here we are led to believe that now “Adam” has confidence in trading the markets, and that all trades are verified and presented in a transparent way. How Does Signals 365 Work? The sales video says that you simply wait for the signals to arrive and then place the trades according to assents, expiry times, and trade results. They even say that there is an alarm bell that sounds off every time a signal comes in “so you won’t miss a trade”. It is not, and on the second registration page you are required to sign up for a broker. Oddly enough, they also add other systems after you subscribe to Signals 365, and this is very strange. If these thieves believe in their product why would they refer you to other auto-traders? Gets you thinking right.. The facts are there and its pointless trying to ignore them. 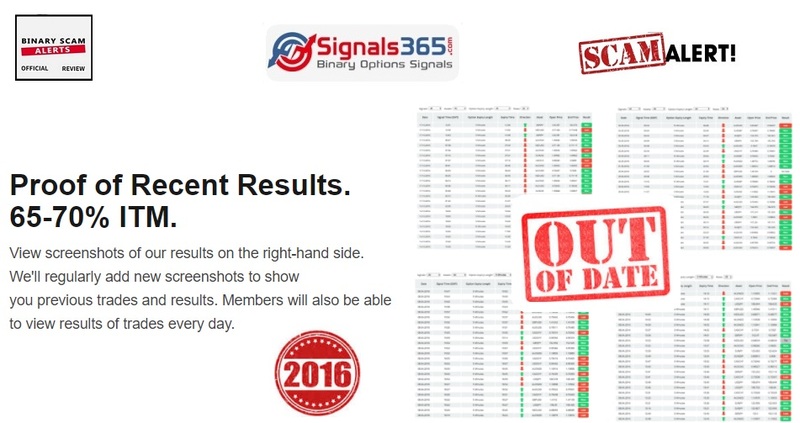 Signals 365 is a fake signals app which was designed with pure malice. We see the usual tell signs such as fake testimonials, inconsistencies in the narrative, lies, fake logos and certification, and various forms of hyped up or exaggerated claims of easy money (although not as much as other systems). We didn’t see the inflated bank accounts, and we did like the DMCA seal, but on the overall it doesn’t mean anything and used to provide a false sense of security. The hot scams trending now are Forex Maverick and Quantum Code by Michael Crawford. If you are deliberating and not sure about which solution is best for you then you are not alone. Our staff of diligent researchers has combed the internet searching for the best and most profitable apps. These have been compiled and shortlisted in our recommended section so feel free to check it out at your convenience. The Signals 365 software by “Adam” the fictitious character is a BLACKLISTED SCAM, and we have proven this fact in our honest and impartial review. The promoters of Signals 365 usually use annoying popups on cellphones and SPAM emails to recruit new victims, its imperative you refrain from clicking on any links you receive to join this program and immediately mark them as SPAM. Additionally, we have seen a few morally corrupt affiliate marketers endorsing this product. We know there are a few fake reviews about this software and while it may be confusing, the best policy is to leave a message below and ask us if you are unsure. We understand that some of you have already been baited and victimized because you were led to believe this software is genuine or legit, in this case it is important to refrain from re-investing and never agree to sign any form or accept any bonus or perk as this locks you in to a trading requirement and you will never be able to cash out. In light of all of the conclusive evidence which has been presented, we are forced once again to BLACKLIST the Signals 365 software, officially label it as an investment SCAM, and advise our members and subscribers to seek alternative investment avenues. Don’t forget to join our Facebook page and Subscribe to our YouTube Channel for more information.